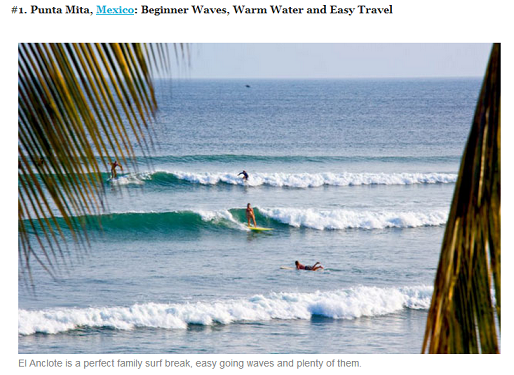 Punta de Mita took the top spot as a family friendly surf vacation destination on the surf portal www.theinertia.com. The Riviera Nayarit has been keeping itself in the spotlight in different specialized tourism publications. On this occasion, surf portal www.theinertia.com gave it first place among the Top Five Family Friendly Surf Vacation destinations. Punta de Mita was highlighted as the best place to go for this audience according to writer Matt Thomson, thanks to its beginners’ breaks, warm water and fantastic amenities for families. The article makes note of the differences of surfing as a youth, when any wave and any place was great, to surfing when one is married with children, when safety suddenly becomes an issue and conditions need to be right for kids. “The sunny coastline just north of Puerto Vallarta is full of surf potential. Surfers have been coming here for decades, drawn to the wide variety of waves and picturesque backdrops,” states Thomson in the article. The complete Top 5 list includes Punta de Mita in the Riviera Nayarit; Belize; Playa Negra in Costa Rica; Tofino in British Colombia; and Siargo Island in the Philippines. Matt Thomson is also the founder of www.wavevacation.com, another page dedicated to recommending top surf spots, where he also mentions Sayulita. “Don’t miss the nearby funky surf town of Sayulita which features a beginner point break, horseback riding, ATV tours, zip lining and great restaurants,” he says in the article. He also considers the tour to Marietas Islands a must. These publications and recommendations are the result of the constant promotional efforts expended by the Riviera Nayarit Convention and Visitors Bureau (CVB).